4.5. What you can change. rebgui-sizing.r is an introduction to the ease of resizable gui creation with RebGUI, highlighting one expandable panel widget and subordinates that move out of the way. The above images were created running REBOL/View 2.7.5.4.2, RebGUI build #93, GNU/Linux 4.0, KDE Desktop. Requires REBOL/View, access to a cached copy of RebGUI or internet access for getting a cached copy. This script is an introduction to the span facet of RebGUI widgets. 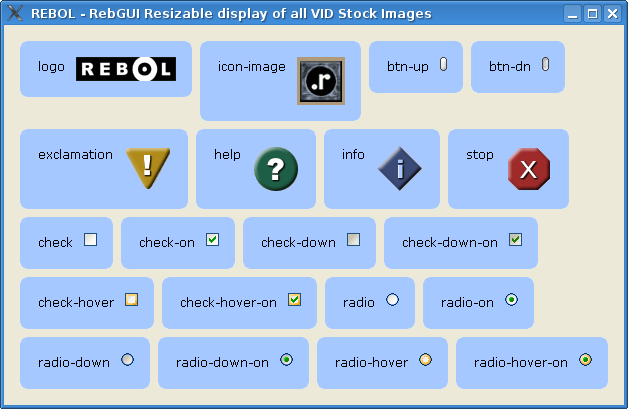 RebGUI gui building is easy, and offers a flexible 'business polish' to application design. There are many features under the hood. One of those features is resizable windows. will act as a preprocessor directive if this program in encapped, but under normal REBOL evaluation will be interpretted as an issue! and a file!. REBOL doesn't care what you do with values, so this syntax doesn't stop the REBOL interpreter. will only evaluate the do-thru if the RebGUI context is not defined. Under the SDK and encap the #include will have loaded the rebgui code, so the value will be there. Under normal evaluation REBOL would 'skip over' the #include (issue!) and %rebgui.r (file! ), and the context will not be defined, so the do-thru will execute. This is a nice "trick" that lets developers test code with do but then allows proper encapping when building a release package. If you do develop something with RebGUI, and build it using the REBOL/SDK, you may not have access to do-thru. The RebGUI home site explains all this. This is just an example, and assumes you are using a full fledged REBOL/View, but shows off the #include trick, for when you are ready. 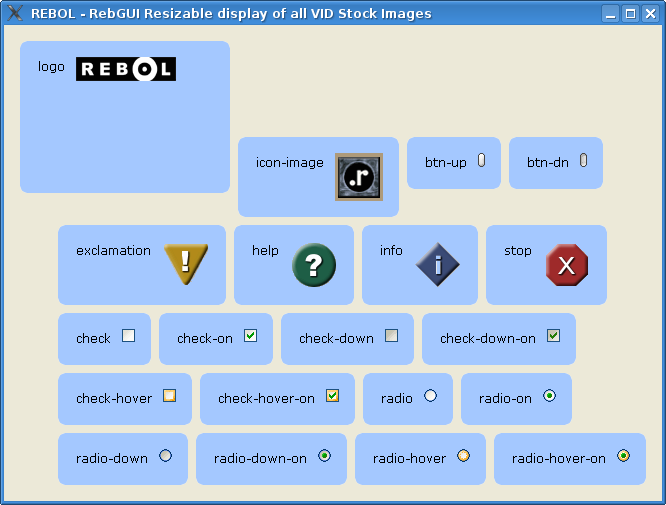 Another way of getting RebGUI is clicking the REBOL/View viewtop Demo RebGUI icon. This short example highlights the use of span facets to control widget resizing and placement during window resizing. Being a short example, it does no real justice to the full power of span and RebGUI widgets. With the proper intelligent placement, span can be used to produce some very professional, resizable layouts with little effort other than planning. When running, you can resize the window and the first panel with shrink and expand #WH. All the other panels will move up and down #XY with no overlapping widgets. 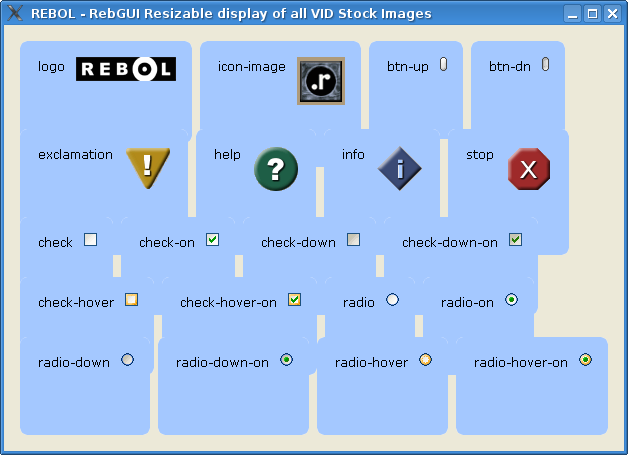 Build 93 of RebGUI supports seven different span directives. Some are for initial placement, others come into play during resize events. The following is taken from the RebGUI User Guide span Directive but the documentation evolves with RebGUI and the section may not be the same when you read this. #L Lateral. Align right-hand edge of widget with display (or grouping widget) edge. #V Vertical. Align base edge of widget with display (or grouping widget) edge. #O Offset (lateral). Move the widget to align with the right-hand display (or grouping widget) edge. #H Height. Stretch/shrink the widget vertically. #W Width. Stretch/shrink the widget horizontally. #X X-Offset. Move the widget horizontally. #Y Y-Offset. Move the widget vertically. It will require a little forethought, but the span directives allow for very nice resizable layouts. For early experiments with your local copy, try changing the span directives. This example script, only allows the first panel to shrink and expand, all other panels just move up/down or left/right. from inside the spec creation loop. This leaves the span at #WH, so all the panels can shrink and expand, but shrink and expand into and over what? The top left corner of each panel is fixed, so they just expand into and over each other. Without some forethought, the span directives can end up messy. With intelligent design, they can make for very professional, easy to manage, resizable widgets. One of the great powers of using RebGUI for application development. You will need access to the internet, at least the first time you do-thru rebgui.r. A note about Mr. Truter, and an apology. The u in Truter is actually &#252;, a diaeresis. I hold a great deal of respect for Ashley, and not getting his name proper is a something I am looking into fixing. It has to do with getting characters encoded cross-platform. When I type it in Unicode UTF-8 under GNU/Linux, it sometimes gets mungled getting to Windows. Using the &#252; web entity sometimes doesn't work when there is a text processor involved. Soon I'll have it figured out and this paragraph will disappear.